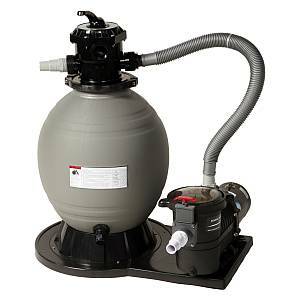 These Sandman Pump Filter Systems will keep your pool crystal clear and deliver years of trouble-free operation. The high quality filter tank is weather resistant and corrosion proof. System comes complete with filter tank, powerful high output pump, base and connections. Low maintenance and simple installation make this system the choice for many applications. The rugged filter tank is constructed of durable polyethylene that withstands mother natures worst and is corrosion proof. Precisely engineered laterals inside the filter provide an even flow through the sand bed ensure maximum filtration and a clean and clear pool. The top mount multi port provides for easy use and quick backwashing. Nicely backed by a 1-Year Warranty.